a-ha has sold millions of albums and singles during an illustrious musical career. From topping the charts around the world with debut single ‘Take On Me’ in 1985 to a hugely successful farewell tour in 2010, a-ha has touched the lives of many. When the band confirmed its comeback, at a Berlin press conference in March 2015, it was the perfect ending – as well as a new beginning - for Living A Fan’s Adventure Tale. Fans from around 50 different countries have been willing to share their wide and varied memories of following the band for this book, in a celebration of what has made a-ha so popular across the globe for three decades. With other contributions from musical collaborators and journalists who have interviewed the band, and academics in fandom, this is a thorough study into the career of the three Norwegians, lavishly illustrated throughout with fans' snapshots and personal photos of the band. 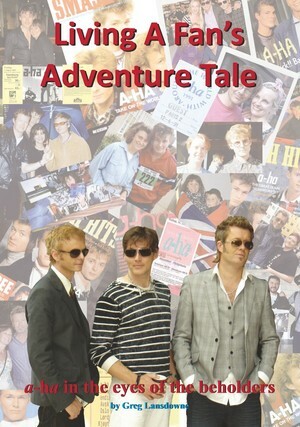 Living A Fan’s Adventure Tale gets to the heart of what it really means to be a fan and is a must-read for all devotees as it puts into words why a-ha endures in the minds of millions of people. The passion conveyed by so many in Living A Fan’s Adventure Tale will change your mindset forever. Author Greg Lansdowne has been a writer and communications professional for more than 20 years, and a fan of a-ha for much longer. He published his own cricket magazine, Big Hitter, and his most recent book was a well-received history of football stickers: Stuck On You: The Rise & Fall… & Rise Of Panini Stickers. Living A Fan’s Adventure Tale is Lansdowne’s first book on music and is published to coincide with the band’s 2016 European tour that once again will see them playing to thousands of devoted fans. FORMAT: A4 soft cover, 297x210mm - 128pp, fully illustrated throughout.